Nothing like Grandma's oatmeal cookies! Yup, these contain oatmeal but that is pretty much the only remnants left of the traditional oatmeal cookie. The addition of cocoa and milk chocolate chips bring these babies up to a whole new level of YUM. You can use any brand of chocolate chips you prefer but for me nothing beats Callebaut Milk Chocolate. 1 1/2 cups added to the batter is sheer perfection. Are they really jumbo? Uh, ya, they are. You can squeeze in about 6 cookies per standard baking sheet and you need to leave PLENTY of room between the cookies as these spread out quite a bit during baking. 3-4" spaces is ideal. This recipe makes approximately 18 large cookies. You will need 3 cookie sheets, each one lined with parchment paper and then you are ready to begin. These are large, sweet, super crispy and oh so chocolatey. Simply put, I adore them. This looks really good. 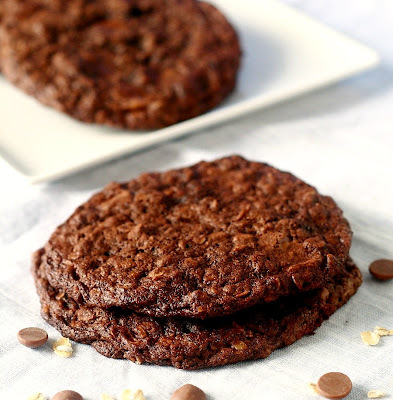 Definitely a chocolate-y improvement over oatmeal raisin cookies! Sounds delicious! I think I'd love the texture of these because of all of those ingredients. I had to go in and whip these babies up immediately. VERY DELICIOUS! I didn't have any chips, so chopped up some chocolate-peanut clusters - worked great. 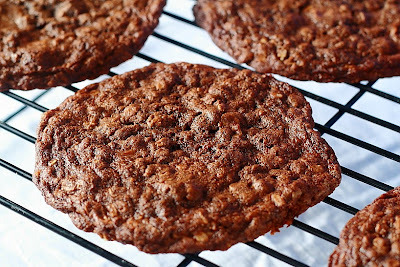 These cookies are super chocolaty and not too sweet. Just wonderful!! These cookies sound soooooo good. I'm craving chocolate big time right now. Must make soon!!!!! I love oatmeal cookies! Gotta try this! Thanks! @Linda - that is wonderful you tried the recipe and really enjoy the cookies !! 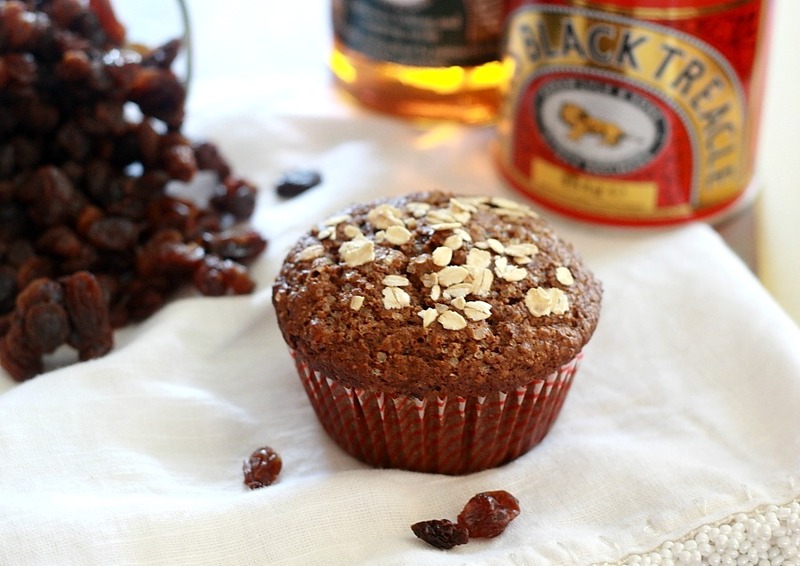 I'm new follower visiting from Foodie Friday, this is all my favorite ingredients,I have to borrow this recipe, hope you don't mind!..I want to make these this weekend! Hope you can visit LazyonLoblolly,I have a Bobby Flay cookbook giveaway. Please let me know if I can borrow this recipe. Holy delicious! 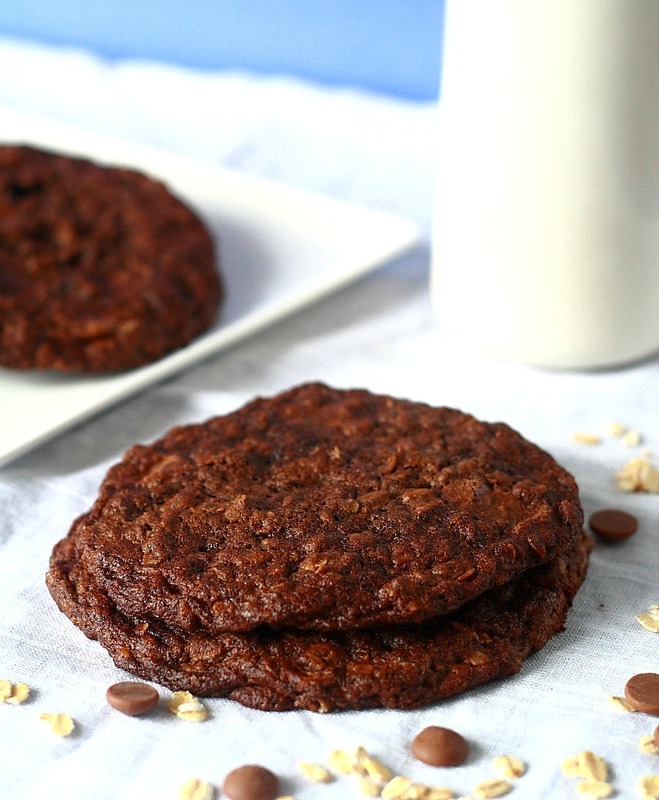 This recipe combines my two favorite things...chocolate & oatmeal. I can't wait to try these! Thanks! These look really delicious. I prefer milk chocolate to semi-sweet. I would love to try one of these. Thanks for sharing on A Well-Seasoned Life's Sweet Indulgences Sunday.